The news lately has been peppered with really interesting history pieces. Two things that come to mind include when Boston opened its time capsule and revealed the contents in January and when England’s King Richard III finally was given a proper burial in March. I love history. So that’s where I decided to go this week with blog profiles. This is a cool blog, and it covers a huge amount of information. It’s authored by writer J.L. Bell, of Massachusetts, who specializes in the start of the American Revolution in and around Boston. 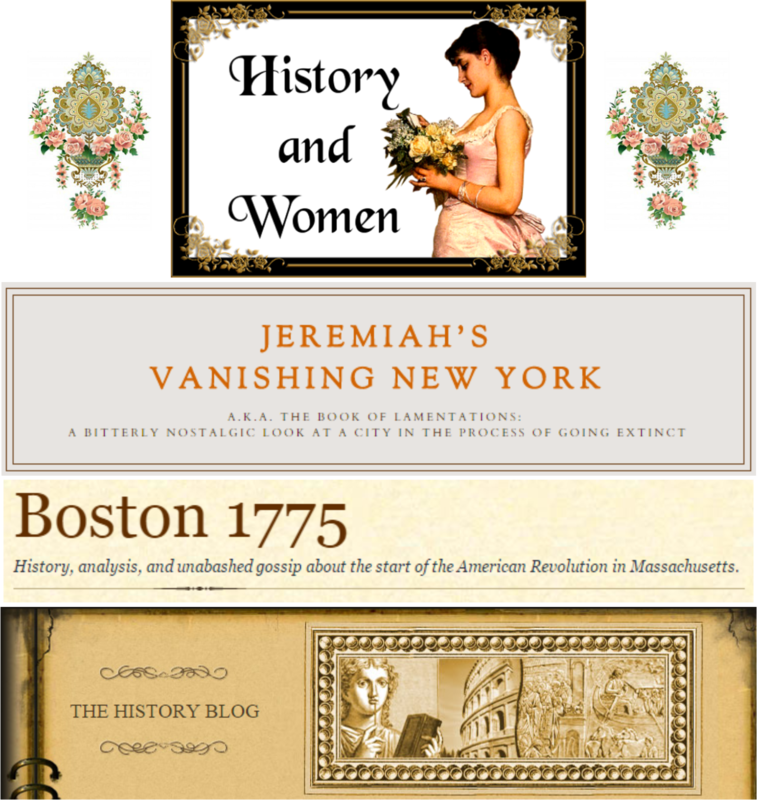 Bell is a prolific writer about this time in history in Boston. I checked out a bunch of posts, including David Hartley: “Singular in his Dress”, Filling in the Hole in West’s Painting, and Stamp Act Approved by King, Leading to a Change of Government. The site itself features book reviews and stories about women in history. The History Blog covers simply what you’d expect: History. It was launched in June 2006 and features posts about ancient history, books, education, medieval, modern(ish) history, museums, Renaissance, and social policy, among other things. This blog gets right to it, covering really interesting times in world history. To select just a handful of great posts really was a bit difficult, but some notables include Rare Earl of Lancaster devotional panel found on Thames riverbank, 17th c. Ottoman war camel unearthed in Austria, and Anglo-Saxon eye salve kills MRSA superbug. I read something similar to The History Blog’s superbug post recently on CNN: Thousand-year-old Anglo-Saxon potion kills MRSA superbug. OK, that’s pretty incredible. The blog is written and managed by blogger Jeremiah Moss. If you read some of his About Me, you’ll find bits from other writers and publications, touting his expertise in the subject. It’s frankly why I selected this blog for a brief profile this week. I like Moss’s writing and his eye for telling NY’s stories. Some posts that still have me thinking include Oyster Bar Blight, Caffe Dante, and The Last Bagel. OK, I loved this shop, which had been in business since 1976. It’s closed now; this hurts. P.S. Ever wonder how we come up with ideas for our blog profiles? Our handy list of industries and subjects on PR Newswire for Journalists stays top of mind. If you’re a blogger or journalist looking for industry-specific or even geographical (like, New York, for example) news, let us know. We’re happy to customize any of those feeds for you on PR Newswire for Journalists. Christine Cube is a media relations manager with PR Newswire and freelance writer. Follow her @cpcube.